The presentation of a gourmet dessert of sorbet prepared by the chef at the Rifflin'Hitch Lodge in Southern Labrador, Canada. A sorbet dessert usually consists of frozen fruit juice or flavored water and sugar but the presentation of desserts is always different especially when created by a gourmet chef. The presentation of this sorbet is served to the guests at the Rifflin'Hitch Lodge in a fish dish with a spoon having a starfish on the top of the handle. The sorbet is topped off with a scoop of dairy and a delicate display of fruit is placed on top. The dish adds to the beauty of the dessert, but once you taste it, the dish is forgotten quickly. Sorbet by Chef Nancy Elliot, Rifflin'Hitch Lodge, Eagle River, Southern Labrador, Labrador, Newfoundland Labrador, Canada. 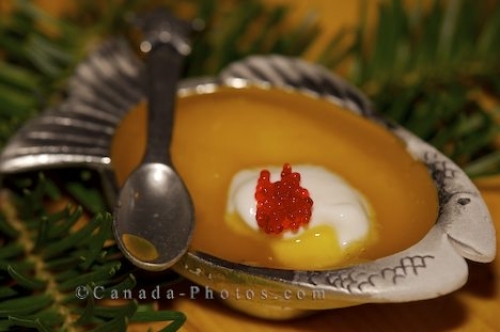 Picture of the presentation of a gourmet dessert of sorbet at the Rifflin'Hitch Lodge in Southern Labrador, Canada.